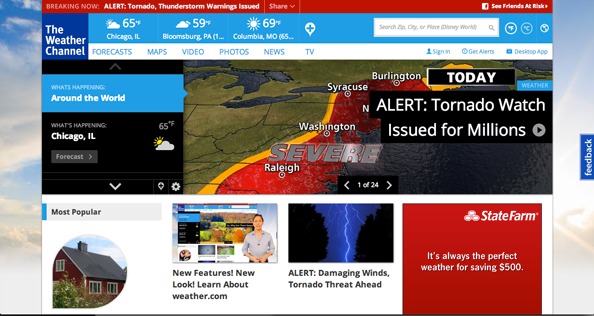 Weather.com, the online home of the Weather Channel, is sporting a new look that attempts to make information easier to access but just ends being a cluttered mess. The new layout smartly keeps local forecasts for user-selected cities across the top of all pages and adds an expandable panel with additional information and links. A large area at the top of the homepage gives users an overview of important news and features. As you scroll down the homepage, sections for video, maps and photos as well as hurricane, science, environment, space and nature news and features are each given a section with large images and typography highlights top content. Overall, the new look isn’t all that impressive — it’s cluttered and graphically inconsistent at times. For example, there are seemingly random petal shaped photos and boxes sprinkled around the site as well as overly distracting shadows and gradients. The homepage is clearly trying to “be all things to all people” and ends up suffering from information overload. For example, at the time this post was written the main featured section on the top of the homepage featured 24 items. 24? Really? There’s really 24 piece of content on the site that merit being promoted that prominently (not to mention who has time to scroll through that many)? The previous design (sample available here from the Internet Archive) was much cleaner and easier to use. The channel is offering up a video tour of the new site and its features with a very enthusiastic tour guide chroma keyed in front of screen captures of the site.